Is the 2.0 compatible with a thru-axle? I have a Trek Domane SL6 thru-axle. It seems that with the quick releases this comes with that it would be ok since I'd be able to remove the quick releases. 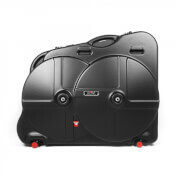 I saw another reviewer has the Domane as well and said it is great. Please advise! Good quality bike bag. Haven't had a chance to use it yet. 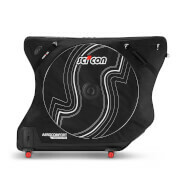 My only concern is scicon could have made it a bit wider fit at the front to protect the handlebars a bit more, other than that the reason for purchasing it is you only have to remove the wheels when packing unlike other bags and boxes. See how it stands up when travelling to Majorca in 2019. It was delivered safely And it was quick. It was very good packaging. Remove your derailleur for transport ! 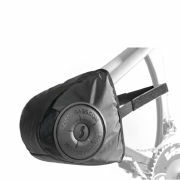 Bought two AeroComfort2 bike bags. Arrived in time however shipper entered the price of two bags (total) on each individual shipping invoice. As such, I had to pay twice the PST and GST on receipt of items. Bags are great; easy to install bike. Word of warning: despite installing the provided rear derailleur protector cage, both bikes sustained damage during baggage handling to rear derailleurs. One derailleur bent badly, one derailleur hanger snapped (luckily didn't damage the carbon drop-out). Highly recommend that you remove your derailleur for transport. I would recommend this product. The travel case is very good, however the description should have included that the fittings only suited quick release skewers and is unsuitable for thru axle type fittings. Simple, easy to fit together, light weight bag. Comes with hand pump also. Hope for good baggage handlers. I have travelled with this bag (borrowed) for 3 trips. They are fantastic to travel with. It only takes 10 minutes to pack the bike. The bike has been fine each trip. However, the wheels are very cheap and loose. They fall off easily and most people tell me they have lost wheels. They are loose when you get the bag. The bag itself gets rub holes easily, so is not very robust. However, I still want one, as the ease of use is fantastic. A good tip is to put the seat up high when you travel, and it takes the slack out of the bag, thus less rub holes. Received on time in good order and love the travel case after having a trial run putting my BMC inside. Able to add many of my accessories as well and after being somewhat of a sceptic, appears that the completed unit is very sturdy and I am confident this item will be more than enough to do my trip back home to Vancouver from Bangkok. Nice looking case and very easy to package together with minimal effort. Very glad I made the purchase on the recommendation from professional cyclist. Thank you, Jim.